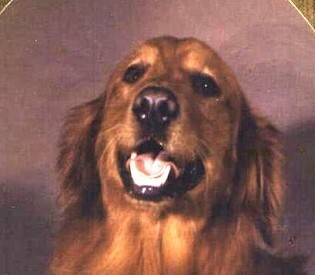 Our first golden retriever. What can we say about Chino. 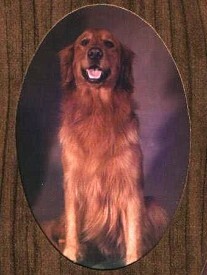 He was a beautiful and wonderful way to be introduced to this wonderful breed. We got Chino from Tom's friend, John and Mary Ann Steele. We were newlyweds and Tom came home and mentioned he'd like to drive out and see some Golden Retriever puppies that his friend John had. I asked "what are golden retrievers?" This was in April 1972. We still lived in our first little apartment and it was a "no pets" apartment. We drove out to look at these beautiful little golden bundles of fur and fell in love. We are forever in John and Mary Ann's debt for introducing us the correct way. They gave us a copy of the GRNews and we were on our way! A few weeks later we brought home our little bundle of fur...to the apartment. We snuck him out to potty in the dark mornings and tried to sneak him out in the evenings behind the building so hopefully nobody would see him. Hah! It wasn't very long, of course, before someone reported us. We bought our first house on July 4 and were evicted at the end of the month. We moved just in time. Needless to say, we didn't get our deposit back! Tom came up with the name Bottichino. He was a tile setter at the time and had seen the name on a box of ceramic tile. It's a brand of Italian ceramic tile. We loved the name. An original. Chino loved everybody. He didn't have a mean bone in his body (except years later when we moved to the country and he would wipe out little wild baby bunnies in their nest). He helped raise my niece and nephews, and to this day, they call him their cousin. He was a good buddy with my best friend's boys and loved to go visit their house and try to climb in the tub with them...he might have succeeded a couple of times He also had my brother Greg as his favorite uncle. He loved to have Greg visit and rub his ears. 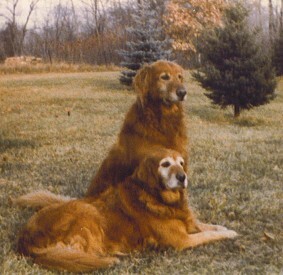 When Chino was 9 months old, we decided he needed a friend, so off we went to find another golden retriever. We got Dixie at 8 months old (we weren't sure if we were ready for another adventurous puppy). Chino and Dixie were best friends and I always referred to them as husband and wife when people asked if they were related. They both went everywhere with me . Chino didn't like obedience (who would...with the old jerk method of training), so he only squeaked by getting his first two legs in Novice. After starting to train Dixie, I let him have his wish and just be Tom's hunting dog. He was very happy with that. Chino lived to be 12 years old when he died of congestive heart failure. He wasn't the smartest golden I've had. 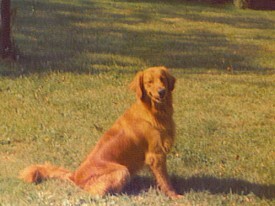 But he was very loyal and I couldn't have asked for a better first dog. I truly felt like it broke my heart when I lost him.